Some of our experimentation has led us down the path of Molecular Gastronomy. While very new to the subject, we’ve been using some of the techniques for years. This page will eventually be a place where we talk about successes and failures, and more recipes, of course. You might have seen some of the wonders of Molecular Gastronomy on Season 2 of Top Chef on Food TV. Marcel used some very interesting techniques that sparked interest in the subject. Click here for the latest experiments. We’re taking on a bit of the tradition of Chef Randy’s grampa, who was a wine maker and apparently did some work with potato fermentation, but we can’t prove it. Much of the equipment actually comes from him and dates back more than seventy years. Something bad happened today. I was experimenting with Xanthan gum. Mixing 1/3 cup of strained pink grapefruit juice, 1/2 cup of sugar into a simple syrup, then adding 1/2 teaspoon of Xanthan gum in a tablespoon of cold water, mixing and chilling, resulted in badness. My kids called it pink snot and slime. It tasted pretty good, even Kris, who swore she’d never have grapefruit, liked the taste, but the texture was completely horrid. Good luck! It took a few days, but here are the results of my first flavour separation experiment. My thanks to Herve This for inspiring me to actually do this. After reducing the water side by half, the most amazing aroma of the caramelized sugars came out. The water has a definite quality of umami as well as, get this, something I’m actually reacting to. Because tomatoes and chillies are related, this result is very promising. It means I actually have a shot at isolating the allergen. Better than the water side, the oil developed the most incredible floral quality after 30 minutes of heating. This has definite potential for future recipe development. Long live the good old Roma tomato, with all it’s complexity. My new toys arrived today! During the week I unpacked my grampa’s old chemistry equipment. Now, the separatory funnel showed up. Cool huh? The picture on the right is my first attempt at using it. The tomatoes were chopped and boiled in water and oil, then whizzed with an immersion blender while still hot, into a tomato sauce. I then poured the sauce into the funnel and let it stand. The picture shows what happened after about 30 minutes. All of the colour is in the oil, and most of the scent and flavour. After the liquids separated, I filtered them through standard filter paper, on the left of the stand.You should be able to see a bit of slightly cloudy liquid in the test tube on the left side of the stand. That’s from the water portion. The yellow colour is in suspended particles, but was not imparted to the water. 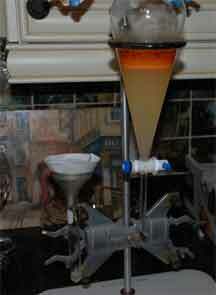 No colour gets dissolved into the water portion.The oil has a lot of orange colour dissolved into it. So, Mom, if you’re reading this, the lesson is to stop skimming your tomato sauce.More to come when I start working with the component parts. 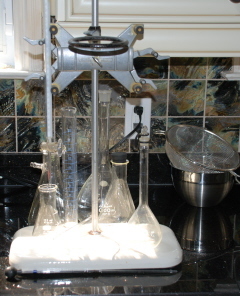 Here’s my grampa’s old chemistry equipment, at least what I managed to salvage before their place was sold. I wish I had managed to get my hands on an ultra-centrifuge, that I know he probably had, but hid from us when we were kids. You would not believe what happened this morning. I tried an experiment with foaming milk in a French filtre press coffee maker – pretty standard stuff. But, adding cocoa and a little sugar, foaming, then cooking in the microwave, and voila! Stable chocolate cappuccino foam. The combination of the lecithin in the cocoa and cooked proteins in the milk gave the foam a really nice airiness and texture. People were raving about it. If you use it, just remember me, ok? Thanks go out to Harold McGee for the suggestion of cooking the foamed milk. You might not believe what happened to the grape cream. It did a partial separation into two foams. Both were set from the gelatine. The top was a frothy grape cream that picked up the sweetness of the grapes and cream – no sugar was added in the preparation. The bottom picked up the tannins and complexity of the grapes but had little of the cream. The flavours separated very distinctly. This has some nice potential and I’m very pleased. This was definitely a cool Hecksperiment! Tonight was a major success. I found a supply of reasonably pure liquid lecithin at a local bulk barn. It’s got about 1/20th the nuttiness of the granulated soy lecithin and, if you let it stand an hour, even that disappears. Blueberry foam! I also had fun with a grape cream. Double cooked scallops (lime/acid cooking then pan searing) worked amazingly too. I’m also armed with syringes for my next meat meal. What Kris doesn’t know is that there’s going to be truffle au jus injected while the meat is resting. Does it sound like I’m having fun? I took the the day off of experimenting to have one of my wisdom teeth out. While getting a prescription filled, I found out that the pharmacy has a supply of pure lecithin that may be pure. I can’t wait to get it on Monday and play from there. Late update: the supplier is back-ordered, probably from all of us MG chefs who are cleaning out their stock. I have the order in, but will have to be patient. Some of you may know that I cracked a wisdom tooth over the weekend. It hasn’t been fun and definitely limited my experiments (and eating). So I went back to foams again, and had great success with a quick (1 hour) gelatine-based strawberry foam. I wouldn’t recommend it for next day, because I went a bit heavy on the gelatine to make it work quickly. I’ll probably post this one soon. The chemistry equipment is at the bottom of the stairs waiting for me to unpack it. We had an interesting time, with the taste test. I ground up some coriander seed and sprinkled it over pineapple on one slice, and on the other, ground up the same amount of black pepper. A total of 1/4 teaspoon of each was used per each slice. The results: Rhys, who didn’t like pineapple before, preferred the coriander. Joseph preferred the black pepper. I’m undecided which I like more, but the prediction of compatible flavours definitely panned out. I’m now working on combining the two in lower quantities and trying to get some subtlety out of it. I’m waiting on confirmation from the restaurant we ate at on their detection of the interesting taste from soy lecithin. That will definite go in the failures page if confirmed. Prediction: A sound theory must be predictive. In that vein, I’m going to try a little experiment when the kids are over. Coriander has similar warming properties to black pepper. It stands to reason that some of the flavour characteristics imparted by the black pepper to grilled pineapple should also be imparted by coriander. If it works, it’ll be interesting. The first attempt at mango foam led to a very strange result. I started with granules of soy lecithin and tried grinding. The poppy seed grinder gave me an extruded tube. Very interesting, but not useful for this experiment. A coffee grinder produced a nice powder. I then boiled down some mango in water and sugar to get a syrup. After about 30 minutes of simmering, I added a half tablespoon of the lecithin and buzzed it with my immersion blender. It foamed wonderfully. However – and this is a big problem – there was a strange scent associated with the lecithin. We use chicken feed in the cats’ litter box. As it turns out, there’s a very similar scent comparing the soy lecithin and chicken feed. I couldn’t help thinking that I had made foam out of the business end of a cat. Oh, it tasted good, but psychologically, I have got to find a different supply of lecithin now. I blamed myself, of course. But at a recent restaurant outing, I experienced the same scent in foam there. After two days being exposed to air, the bag of lecithin has also taken on the same lovely aroma. Yuck.